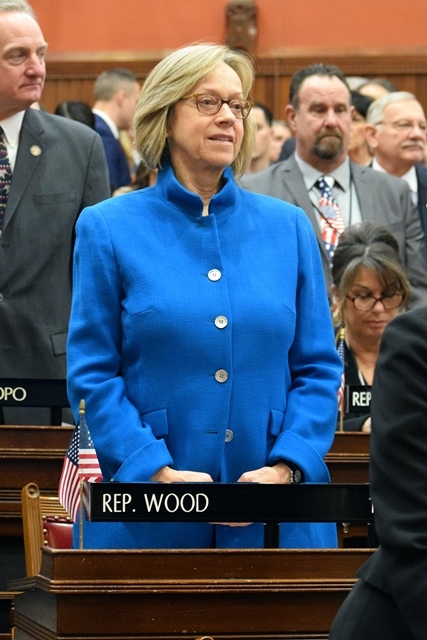 HARTFORD — State Representative Terrie Wood (R-141) joined legislative colleagues on Wednesday, Opening Day of the 2019 Legislative Session, and was sworn in to her sixth term. She will serve for two years as State Representative for the 141st General Assembly District of Norwalk and Darien. Rep. Wood’s legislative committee assignments for this term are Human Services; Finance, Revenue & Bonding; and Higher Education & Employment Advancement Committees. In addition, she was named House Republican Policy Chairman. The Human Services Committee holds responsibility for the Department of Social Services and the Department of Rehabilitation Services. The Finance, Revenue & Bonding Committee deals with all finance, revenue, capital, bonding, fees and taxation matters and anything relating to the Department of Revenue Services. Finally, the Higher Education & Employment Advancement Committee has cognizance over the community colleges, state university system, and the University of Connecticut – as well as workforce development programs. To follow Rep. Wood’s proposed legislation, visit her website (www.repterriewood.com) and click on the “Legislation” tab, or sign up for her email updates. To follow committee meetings and House debates as they unfold live on Connecticut’s public affairs television network, CT-N, tune your TV to Channel 59, or stream the proceedings online at www.ctn.state.ct.us.